Raising Z and Lil' C: Kombucha, Yes Please!!! Have you jumped on the Kombucha bandwagon yet?? I was hesitant to do it for about 2 years...it scared me! Then I bought a $4 bottle at our local health food store and was hooked. At $4 a bottle I couldn't justify my addiction so I finally bought a scoby (the bacteria culture, looks like a jelly disc) from Cultures of Health and I am now making it at home. It took Scott awhile to jump on the wagon with me but now he can't get enough! It costs very little when you brew it at home and it really isn't that complicated. Once a week you have to spend 15 minutes (if that) to bottle your week old kombucha and brew a new batch but that is it! It is filled with loads of pro-biotics and is so good for you. 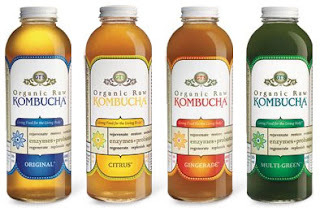 There was an article going around awhile back that kombucha contains flouride and so it isn't all that great for you. But after more research I found that if you steep the tea minimally, use organic tea and water without flouride...the flouride content should be minimal. So if you are intrigued by the science experiment brewing in my family room (I know my bookclub was), check out this video to learn more. And come join me on this tasty, fizzy, healthy bandwagon...you will be glad you did! A New Tradition is Born!